When contemplating additions or remodels for your home, it is important to consider not just the overall appearance of these improvements, but also how you can protect your investments. Whether you wish to add a new coating or start fresh with prefinished doors, be sure to familiarize yourself with the options for exterior door finishes. 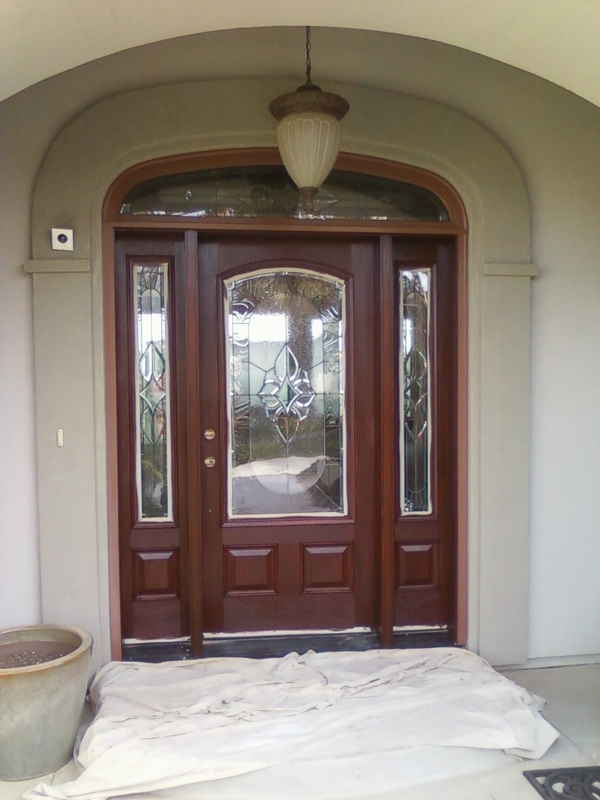 Prefinished doors of all types and materials are available with a variety of treatments. Wood-cladding finishes can be added to fiberglass and steel doors to give them the appearance of traditional wood. For wood doors, there are a variety of stains available. Read on to learn more about exterior door finishes. Generally speaking, there are three categories of stains for exterior doors. Clear stains are almost entirely transparent, allowing the natural wood grain to truly shine through its finish. Although you will be able to see more of the wood, the downside is that a clear stain will also expose your door to sunlight more. This exposure means that you will need to reapply clear stains to prefinished doors as often as every two to three years to ensure that the wood remains protected. Over time, wood under clear stains will eventually discolor or fade despite proper care and reapplication. At this point in a wood door's lifespan, homeowners usually switch to semi-transparent stains. Somewhat bulkier but more protective than clear stains, semi-transparent stains still allow natural wood to show through, but with a touch of color, as they contain a small amount of pigment. Color choices can resemble popular exterior wood options. Whether it is a faded prefinished door or a newly coated door, semi-transparent stains are often applied in five to seven year intervals to help accentuate the original wood color. Acting similar to paint, opaque stains offer far more protection than their clear alternatives. This protection, however, comes at the cost of the wood's natural appearance. While opaque stains cover up much of the wood's natural color, the grain of the wood still shows through. Homeowners can select opaque stain colors for their prefinished doors to complement the wood. There are a variety of color options for opaque stains. Consider your options carefully, because in order to change a prefinished door with opaque stain, the surface will need to be completely sanded. Usually opaque coatings are reapplied every ten years. Traditional wood requires considerable maintenance, especially when exposed to the elements, and wood can become warped in fluctuating temperatures. Prefinished doors made with vinyl cladding offer the classic appearance of wood, but with the added endurance of vinyl to protect the wood. Although vinyl wood cladding finishes do fade over time from exposure to ultraviolet light, these finishes are rot-resistant and energy-efficient. Exterior stains don't require much surface preparation before application. After sanding out any cracks, a new coating can simply be reapplied, however before doing so, homeowners should note the type of stain used on prefinished doors, as it can be damaging to mix an oil with prior latex stain, or vice versa. Whether you're looking for a durable stain to protect a precious mahogany entry door or simply trying to spruce up a fiberglass front door, there are a wide selection of exterior door finishes available. Choosing a prefinished door is one of the easiest options.